If you are anything like me, chicken wings can be quite addictive. From grilling to smoking and everything in between, cooking chicken wings are one of my favorite things to do. This recipe delivers crispy skin and a sweet and spicy sauce that is so delicious you will want to put it on everything. Now sit back, grab yourself an ice cold OB lager and enjoy this post for Spicy Smoked Korean Chicken Wings. A little secret to share with you is to prep your chicken wings a day in advance and let them dry age overnight. This helps get the skin super dry and when you cook the wings you will find the skin crispier than you have when cooking them right out of the package. Takes a little discipline and planning, but well worth the effort. With that said let’s get in to making the best dang chicken wings in the world! The sauce has several ingredients to help develop the deep layered flavor that will keep you coming back for more. Gochujang , sesame oil, soy sauce, rice vinegar, honey, ketchup, white pepper, butter, ginger, garlic, and fresh lime juice all come together to make this deeply satisfying BBQ sauce. After you prep the ingredients, mix well, and put in a saucepan over medium heat until you get a slight boil. From there, pull the sauce away from the heat source and let cool to room temperature. The day of the cook take the wings out of your refrigerator and apply a small amount of slather (in this case I used some hot sauce from the fridge). You do not want to use too much as this isn’t for flavor as much as it is as a binder to help the seasoning evenly coat the wings. For the rub I used a simple mix of salt, pepper, and ground garlic. While the wings absorb the seasoning and come up to room temperature, it is time to set up your grill. For this recipe, I used a Big Green Egg but you can use any grill or smoker as long as you can set it up for indirect cooking. Preheat to 350° and set up for indirect cooking using your convEGGtor . Add a chunk or two of your favorite wood (for this cook I used apple wood). Then let your environment settle until ready. Now for my very first GRILLING BY FEEL tip for you. When you are smoking any kind of meat there is a good smoke and a bad smoke. Remember, the flavor of the smoke is what will be imparted on your meat. If the smoke is white and billowy (pictured below) that is all of the carcinogens burning off and that acrid flavor is what you will taste in your meat. What you want is that thin blue line of smoke coming from your grill (pictured below). The flavor from this smoke comes from the gas released from the wood and charcoal burning in your grill not the smoke itself. So, setup your grill at least an hour before you cook so you can be assured of the right smoking environment. Trust me on this as this is a key step to learning how to GRILL BY FEEL. When your grill is ready place the chicken wings inside and let them cook for 30 minutes before checking. After another 20 minutes it is time to check your wings. Your next GRILLING BY FEEL tip is to look at the chicken skin to see if it is ready. By this point most of the fat should have rendered from the wings leaving behind golden brown and crispy skin. If you take an internal temperature at this point the wings should measure anywhere from 165° to 200°. If it is higher, that is ok as chicken wings are very forgiving. What you want is that crispy skin! If they aren’t quite there yet, let them cook some more. When you have the result you want pull the chicken wings and cover them with most of the Korean BBQ sauce. I say most as this sauce is so delicious you’ll want to reserve some for dipping later. As you glaze the wings crank the heat up on your grill to 400° before placing them back inside to caramelize. You can also cook the wings over direct heat for this last part, just be careful as the sugar in the sauce can burn which will not look or taste very good. After the wings finish their last 10 minutes on the grill it is time to pull them, let them rest, top them off with your choice of cilantro, green onions, toasted sesame seeds, chopped peanuts, fresh lime, and the remaining Korean BBQ sauce. Have a few napkins handy while you enjoy the Spicy Smoked Korean Chicken Wings. 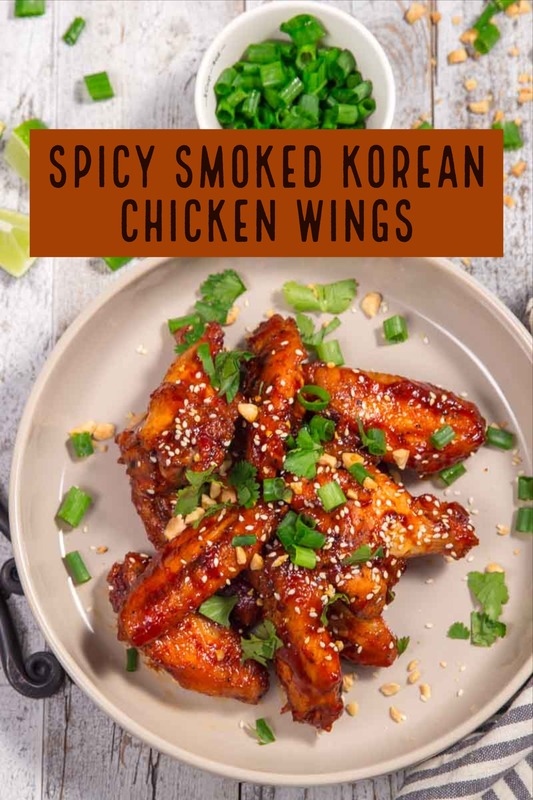 This recipe for Spicy Smoked Korean Chicken wings is my new favorite recipe! The smokey chicken, crispy skin, and amazing combination of the sweet and spicy sauce will have you craving more. To get crispy skin, take the wings out a day before cooking them. Let them air dry in your refrigerator to dry the skin out before smoking them. (note: the wings will still be delicious if you skip this step, but it is worth the extra effort if you can do it). The day of the cook take the wings out of the fridge while you set up your smoker/grill. Light your grill and get it up to 350° set for indirect cooking. Make the sauce by combining all of the ingredients and heating in a saucepan over medium heat until you get a slight boil (don't over heat). Take the sauce off the stove and let it cool to room temp. As the grill is coming up to temp toss the wings with some hot sauce, salt, pepper, and garlic. Add a chunk of your favorite fruit wood e.g. apple, cherry, etc. and allow the smoke to calm down to a thin blue stream. When the grilling environment is ready it is time to add the wings. Let them cook for 30 minutes then flip to the other side. After 20 more minutes check to see if the wings have rendered their fat and the skin looks crispy and brown. When the wings are ready take them off the grill and toss with the Korean BBQ sauce reserving some for dipping later. Add the wings back on to the grill and let cook for another 10 minutes to caramelize the sauce. When ready pull the chicken wings off the grill and let rest while you prepare and add extra toppings. You can use any or all of these to serve: fresh lime, cilantro, green onion, toasted sesame seeds, chopped peanuts, and the extra Korean BBQ sauce.